LAS VEGAS -- The intake was unplugged Wednesday to finish flooding an $817 million tunnel and complete a complicated and perilous "Third Straw" project to draw drinking water for Las Vegas from a shrinking Lake Mead. 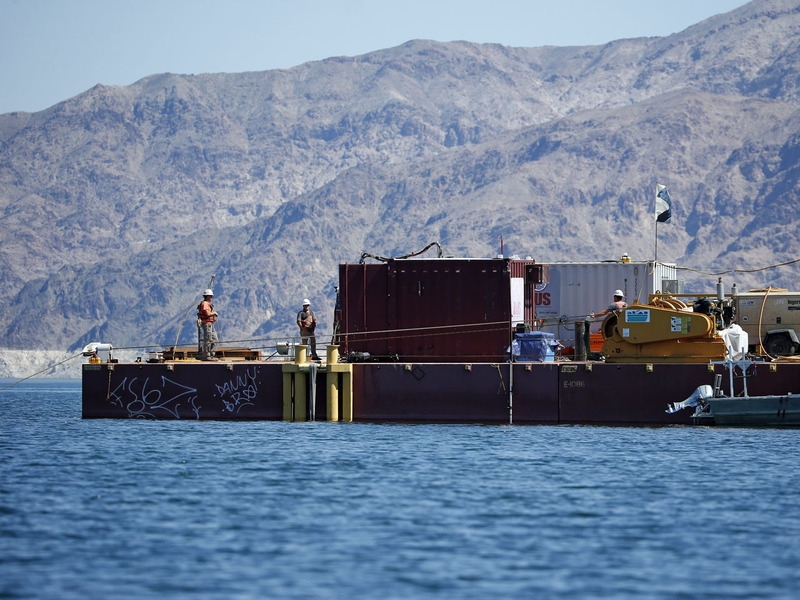 An 8.6-ton steel ball was hoisted to a barge, Southern Nevada Water Authority spokesman Bronson Mack said, in essence pulling the plug on a massive lake-bottom structure built somewhat like a big bathtub drain. "It's a milestone. We're ready for operation," project chief Jim Nickerson, of Vegas Tunnel Constructors, said ahead of the final act in the six-year project. The pipeline won't draw more water from the lake than before, or make the surface level drop any faster. But it will keep taps flowing in Las Vegas homes and casinos even if drought-stricken Lake Mead drops to its lowest levels, officials said. The next step will be completion in 2020 of a third pumping station. That job begins next month and will cost another $650 million. Why is the new intake needed? The new pipeline can draw water from the deepest part of Lake Mead, the snowmelt-fed Colorado River reservoir behind Hoover Dam that provides more than 90 percent of Las Vegas' drinking water supply. Erika Moonin, water authority project manager, said Tuesday it should ensure an uninterrupted supply far into the future. The new intake taps the lake at 860 feet above sea level. That's 190 feet below the tallest existing intake and 218 feet below the lake's surface level Wednesday. The reservoir is down 147 feet from when it was at full capacity in 1983. It's currently 38 percent full. The water will flow through the pipeline to the Las Vegas area, about 30 miles away. The region had about 126,000 residents when it began drawing water from Lake Mead in 1971. It now has 2 million residents and draws 40 million tourists a year. Southern Nevada averages a little over 4 inches of rain a year, and the Southwest U.S. is also gripped by a record 15-year drought. Customers served by the Southern Nevada Water Authority and its seven member agencies are footing the bill. How was the pipeline built? The tunnel runs 3 miles. It was drilled by Vegas Tunnel Constructors, a Nevada-based subsidiary of Italy-based engineering giant Salini Impregilo. About 300 people worked on the project. One worker, Thomas Albert Turner, 44, of Henderson, died on the job in June 2012. A $25 million drilling rig the length of two football fields was lowered in pieces 600 feet underground and reassembled to chew through bedrock while inching along a set of rails. The tunnel was tiled behind it with more than 2,400 14-inch-thick sections of curved concrete. The result is a clean, 20-foot-diameter tube big enough for a subway train. It slopes slightly from the bottom of a vertical shaft below Lake Mead's Saddle Island to a round vault cemented to the lake bottom and capped by what Nickerson called a hemispheric bulkhead. That's the plug that was pulled Wednesday. It weighs 17,200 pounds. Is there a comparable project? Engineers have compared the pipeline project with building the Lincoln Tunnel beneath the Hudson River in the 1930s, the Eisenhower Tunnel on Interstate 70 west of Denver in the 1970s, and Hoover Dam itself. Building the dam took five Depression-era years. It cost $49 million and the lives of about 100 workers. It was completed in 1936. The dam would cost some $840 million if it were built today. When will the water flow? Water could be flowing as early as this weekend, Mack said. Tunnel flooding began just after Labor Day, and it took two weeks to equalize water pressure between the lake and tunnel. The only thing left is to open a sliding gate to let water flow into a connector tunnel feeding one of two existing pumping stations between the lake and Las Vegas. One of the last projects once the drilling rig and rails were removed was to install a water sampling conduit and twin chemical pipelines running the length of the structure. The pipes will deliver ammonia and chlorine to the mouth of the intake, where officials say they'll mix to create chloramine - a compound that is used to eradicate quagga mussel larvae. Quagga mussels reproduce rapidly in fresh water and grow into fingernail-size shells that clog water pipes and cause maintenance problems.